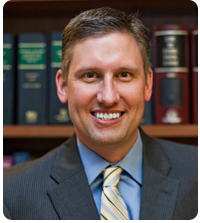 Shawn C. Snyder is a member of The Florida Bar and the Broward County Bar Association. He is a graduate of the University of Florida (B.S. ), the University of Florida Graduate School of Accounting (M.A. ), the University of Florida Levin College of Law (J.D. ), and the University of Miami Law School (LL.M. in Estate Planning). Shawn is board certified by The Florida Bar in Wills, Trusts and Estates, and is an adjunct professor in the University of Miami Law School Graduate Program in Estate Planning, where he teaches Income Taxation to estate planning attorneys. Shawn is also the Chairman of the prestigious Florida Bar Wills, Trusts and Estates Committee which is charged with writing and grading the examination that certifies attorneys as Board Certified Specialists in the area of Wills, Trusts and Estates. 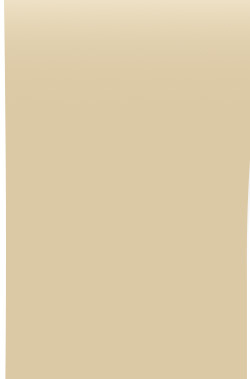 Shawn is a Partner with the firm of Snyder & Snyder, P.A., which is rated “AV” by Martindale-Hubbell Legal Directories. The “AV” rating is the highest rating given to a firm by Martindale-Hubbell. 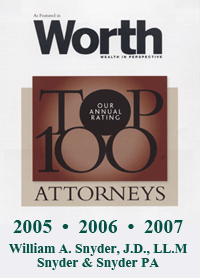 Additionally, for three consecutive years, members of the firm have been named in Worth magazine as one of the "Top 100 Attorneys" in the United States, have been listed for the past four years in Florida SuperLawyers® magazine, and have been included in The Best Lawyers in America® in the specialties of Trusts and Estates for the past three years. Shawn limits his practice exclusively to estate planning, estate administration, and creditor protection matters. He is a former member of the Florida Bar Committee on Relations with the FICPA and CPA's, a founding member of the West Broward Estate Planning Council, a past Chairman of the Planned Giving Committee for the United Way of Broward County, a member of the Nova Southeastern University Professional Advisory Committee, and a member of Florida Blue Key. He is also a frequent lecturer on Wills, Trusts, Estate Planning, Estate Planning with Digital Assets, and Creditor Protection topics.